The international airport of Málaga, Pablo Ruiz Picasso, the international airport of San Pablo, Seville, the airports of Jerez, Gibraltar and Faro, the principal ports of entry by air. Málaga airport is situated 8 km from the centre of the city and is perfectly connected with all of the Costa del Sol. It is the chief of all Spanish airports and one of the original installations in the very first air transport system established in Spain, in 1919. The airportás busiest routes are those throughout the Eurpean Union. London-Gatwick is the route with the greatest volume of passengers, followed by Manchester, London-Luton, Dublin, Brussels and Amsterdam. Málaga airport also has a significant level of internal national air traffic, with Madrid-Barajas, Barcelona, Palma de Mallorca and Melilla. Málaga´s airport is also currently undergoing important modernization in its own infrastructures, such as in the terminal areas as well as the airfield itself, as laid out in the denominated Plan Málaga. In 2005, the airport recorded 12,669,019 passengers, 123,959 flights and 5,493 tons of freight. 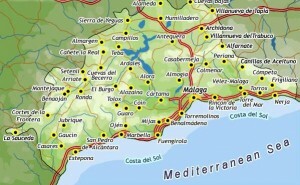 Access: Access from Málaga and from the Costa del Sol are by the motorway E-15 and the national route N-340. 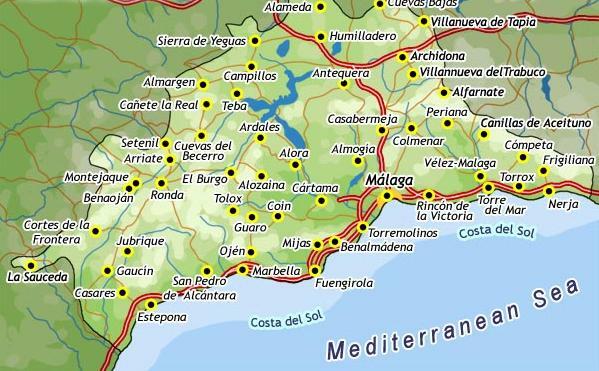 Route: Málaga-airport: Paseo del Parque (Ayuntamiento)-Paseo del Parque (Plaza de la Marina)-Alameda Principal-Avenida Andalucía (post office)-Callejones del Perchel (market)-Bus station-Héroe de Sosota (6 stops)- Avenida Velázquez (9 stops)- Avenida Comandante García Morato (roundabout )-T2 (departures)- Avenida Comandante García Morato-Cargo Terminal. Airport-Málaga: Cargo Terminal – T1 (arrivals) – Airport (administrative services) – Avenida Comandante García Morato (flying club) – Avenida Comandante García Morato (San Miguel) – San Julián (inter-airport) – Avenida Velázquez (10 stops) – Avenida de la Paloma-la Hoz-Ayala-Explanada station (rail station) – Bus station – Callejones del Perchel (market) – Avenida Andalucía – Alameda principal – Paseo del Parque (Plaza de la Marina) – Paseo del Parque (Ayuntamiento). Stops: Terminal 1, arrivals. Terminal 2, departures. By train: Línea Málaga and Fuengirola. Due to the expansion programme at the airport, access to the rail station for the local service (cercanias) is currently via the P-2 parking zone, on the departures level of the airport terminal (in front of the T2 check-in). Stops: Next to the cargo terminal. In front of terminal 2. Times: Airport-Málaga: 07:09 to 23:59 / Málaga-Airport: 05:40 to 22:30 / Airport-Fuengirola: 0554 to 2244 / Fuengirola-Airport: 0636 to 2326 / Every half hour. Airport-Málaga: Mon-Fri, 1,05 €; Saturday and festivals, 1,15 €. Airport-Fuengirola: Mon-Fri, 1,65 €; Weekends and festivals, 1,80 €. Situated inside the municipality of Jerez de la Frontera, 8 km north-east of the city, the airport constitutes one of the hubs in tourism development in the province of Cádiz. Since 1993 Jerez has seen an important increase in international air trafic, most of it charter. The principal countries served by the airport, as well as Spain, are Germany and the United Kingdom. In 2005, the airport recorded 1,297,134 passengers, 38,235 flights and 239.5 tons of freight. Access: July 2003 saw the inauguration of a dual carriageway (autovía) access route to the airport from the motorway N-IV. This has doubled the section of the N-IV of 5,20km from Jerez to the airport, and has incorporated a átrumpetá access link to the airport, via an overhead bypass of the N-IV. Similarly, the link with the N-346, connecting the N-IV to the AP-4, which used to give access to the airport from the N-IV, has been upgraded and widened. Getting there: Bus: Línea (line) M-050. 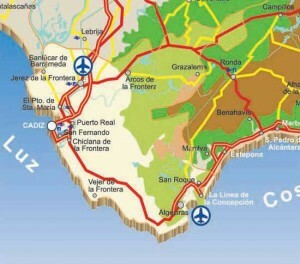 Route that connects Cádiz, Jerez and the airport. Journey time: From Cádiz, 1 hour 15 minutes, approximately, and from Jerez, 30 minutes. Times: for timetables, consult the web site of the Consorcio de Transportes Bahía de Cádiz. Price: From Cádiz, 2,60 euros; from Jerez, 0,85 euros. Línea (line) M-051. 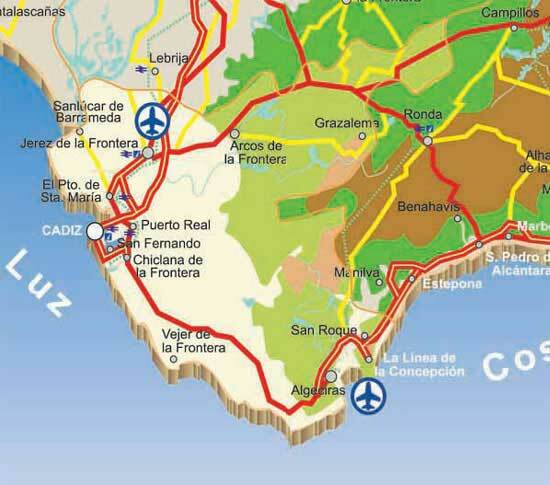 Route that connects Cádiz, El Puerto de Santa María, Jerez and the airport. Journey time: From Cádiz, 1 hour 15 minutes, approximately; from El Puerto de Santa María, 45 minutes; and from Jerez, 30 minutes. The airport of Seville, situated ten kilometres north-east of the city, faced its greatest expansion in 1992 when, in preparation for the Expo 92 in the city, the airport constructed a new terminal building, enlarged its landing and standing areas, and opened a new access route from the N-IV motorway. It also built a new control tower to the south of the airport complex. It was designed as a building rooted in Sevilleás culture and, for that, it includes three traditional design components: the Mezquita, the Palace, and the orange tree. An orchard of orange trees receives the traveller on arrival at the airport, entering through a blue area to give the effect of the glazed tiles of the city, and crowned by a series of arches supported by vaults, echoing various stages of the cityás architectural heritage. Seville airport serves a fundamentally national traffic, but also international. The national traffic represents 79.8 per cent of its total traffic. In 2005, the airport moved 3,521,112 passengers, 55,423 flights and 6,352 tons of freight. Access: From Seville, via the dual carriage (autovía) from San Pablo connecting with the national motorway A-4 towards Madrid. At point 533 km, there is an access turn-off for the airport. From Cádiz and Huelva, along the SE-30 towards the junction with the A-4 and, further on, taking the turning at 533. From Córdoba, before reaching Seville, the route reaches the same access turn-off at 533 from the A-4. Línea de Transportes Urbanos de Sevilla (urban bus service) which links the Puerta de Jerez with the airport. For the times of services between city and airport, as well as intervening stops, you can consult the web site of the Seville transport authority, TUSSAM. Price: Single journey, 2,40 €; monthly ticket, 32,50 €. From July 1965, the airport at Fargo grew rapidly, supporting the rise in the number of international visitors to the region. It is Portugalás principal tourist airport, and has a modern and efficient infrastructure able to provide quality services to the regions of the Algarve and Huelva province and city. Situated 4 kilometres from the capital of the Algarve, at the centre of the coastline that stretches from Cabo de San Vicente towards the natural park of the Doñana, in Huelva, it offers airlines, tour operators and passengers access to a region with a very diverse culture and geography. Access: Arrivals and departures are very well signalled from the airport intersection on the regional EN125 motorway. Getting there: Bus: You can catch a bus at the exit from Arrivals. There are various local buses that link the airport with the centre of Faro (consult the timetables on the noticeboard next to the information point). AEROBUS provides a shuttle service between the airport and the city centre during the months of July-October. During the Second World War, the strategic value of Gibraltar rose with the construction of the airport. Originally, it was an army emergency landings strip , but after reclaiming land from the sea, the strip was used (and continues to be used) as an important gateway for travellers. Sited on, or on the side of, the frontier with Spain, entry to which is by a short walk and the presentation of the relevant papers. A carpark outside the airport perimeter serves as a stop for buses and taxis, although British taxis from Gibraltar cannot cross the border and operate as taxis in Spain (the rule operates in the opposite direction for Spanish taxis). Therefore anyone using the airport and needing a taxi will have to use a taxi serving the territory they are visiting. Airport Federico Garcia Lorca. Granada-jaen. Located in the municipal district of Chauchina, some 10 kilometres from the capital, it has been fundamental in Granada’s recent development. Mainly a domestic airport, it’s linked to the country’s main airports by an extensive timetable, connecting it with international flights. In 2007, Granada Airport registered 1,353,332 passengers, 20,232 operations and 64,849 tonnes of goods. Access: From Granada, you can get directly to the airport on the A-92 direction Seville. From Jaén, on the N-44 to Granada and the A-92 direction Seville. Getting there:A bus links the airport precinct with the city of Granada. Itinerary: Airport – Bus station – La Caleta – Avenida de la Constitución – Jardines del Triunfo – Gran Vía – Puerta Real – Palacio de Congresos. Timetable: Check times, and stops, on the Autocares José González website, the company that runs the service.